The problem with this cartoon is that it is Secretary Rokita’s fellow Republicans who have expressed the most concern about Secretary Rokita’s proposal. According to Star reporter Mary Beth’s Schneider, “Rokita found the most agreement from House Speaker B. Patrick Bauer, D-South Bend, who agrees that an independent commission isn't the answer. Rokita's general concept, he said, ‘makes some sense.’” Compare that sentiment to the statements Republican legislative leaders: “‘I don't think it’s his business,’ said Senate President Pro Tempore David Long, R-Fort Wayne. ‘The secretary of state has overstepped his bounds’” and “‘Our constitution says this is clearly a legislative function,’ said House Minority Leader Brian Bosma, R-Indianapolis, ‘and not a function of the secretary of state’s office or any other administrative office.’” Yet in Gary Varvel’s world,it is the Democratic leader who stands in the way of redistricting in the name of “permanence of incumbency”. It is also worth noting that the House, presided over by Speaker Bauer, is very evenly divided; not every race may be competitive, but the House itself is evenly divided (just a few years ago, it was Speaker Bosma and Rep. Bauer). The same cannot be said for the Senate where gerrymandering has given the Republicans an apparently insurmountable advantage. In the past, I’ve been critical of Secretary Rokita for inserting politics into the electoral process where it does not belong. At first blush, it appears that this proposal does the exact opposite: It seeks to remove politics from the electoral process so that our democracy can be more representative and for that he should be commended (though I’ll reserve final judgment on the proposal until I’ve examined it more thoroughly; for starters, I want to be sure that Secretary Rokita’s proposal was did not incorporate political data ). On the other hand, Gary Varvel should be asked to explain why he took a shot at Speaker Bauer while letting Sen. Long and Rep. Bosma off the proverbial hook. More detail on Secretary Rokita’s proposal (and the brightly colored but hard to read maps prepared by his office, apparently at taxpayer expense of nearly $110,000…) can be found at the new Rethinking Redistricting website. Update (September 15, 2009): Repaired broken link to cartoon. 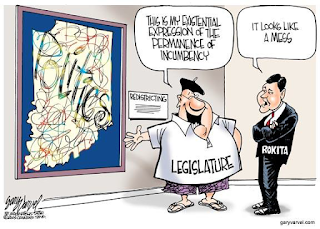 Bosma is on record, for many years now, as supporting nonpartisan, independent redistricting, so his concern with Rokita is likely what Bosma said -- that the legislative branch, not executive branch, has the constitutional duty to draw the maps. There is no sense, and indeed some danger, in diverting attention from that duty. Todd may be right, but he has no authority to get it done; the burden to do the work and do it right rests squarely on the shoulders of House and Senate leadership and that's where it needs to stay or this issue will get diluted in politics and lost. And voters will be screwed again. As for Bauer, he has vigorously defended the current horribly gerrymandered maps while Bosma has been highly critical. As for Long, I don't recall him defending or being critical of the maps, but one thing is for sure, he was not in Senate leadership when they were drawn (House democrats drew the House maps, and Bauer was a House D leader and key participant when the current maps were drawn). Varvel's not so bad. Just may need more words to explain his pictures. I don't really disagree with anything that you've said as it relates to the "big picture" of redistricting and gerrymandering. My focus was more limited to Secretary Rokita's idea and Gary Varvel's commentary on the reaction of the "Legislature" to that idea. 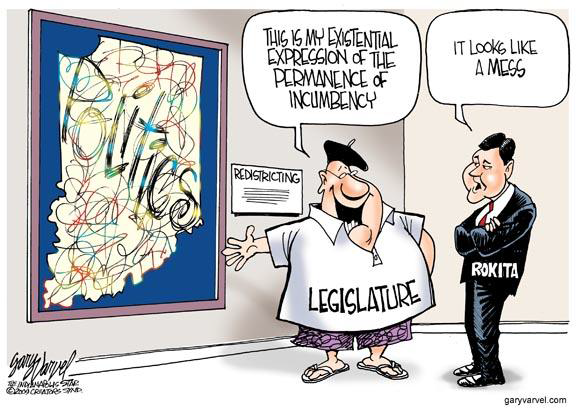 And while it may be the job of the legislature to draw the maps (do you think the maps are actually drawn by the legislature or by some outside agent or entity on behalf of the entity), Secretary Rokita's concepts may be worth exploring. It may be the job of a particular house of the General Assembly to introduce fiscal bills, but that doesn't mean that the other house or the executive branch don't participate in the process or offer suggestions or proposals. Unfortunately, the image appears to be missing from The Indianapolis Star's website also. They rearranged things, but even when I go to Gary Varvel's page and scroll back to September 8, 2009, the image isn't available (a blank box shows there, just like on my site). I also tried searching for the image elsewhere online without success. Sorry.